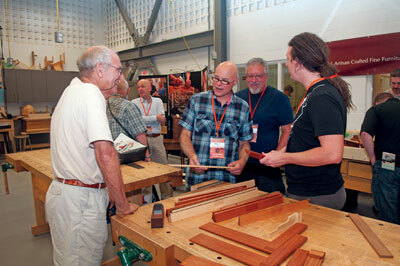 On a beautiful late September weekend woodworkers from across Canada and the northeastern United States made a small Ontario town seem like the centre of the woodworking universe. 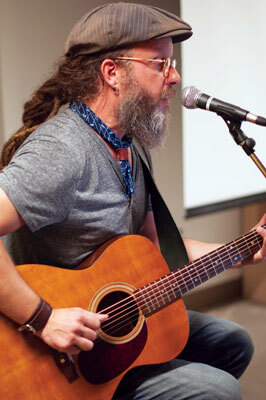 Perth, Ontario, an hour south of Canada’s national capital Ottawa, was the stage for Woodworks ’14 and WoodObjects. 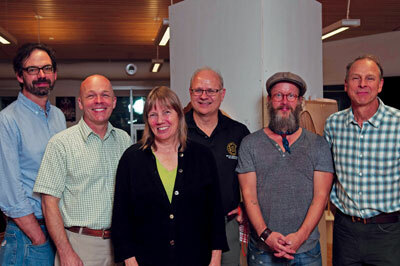 The event was a project of the Ottawa Woodworkers Association, in conjunction with the Algonquin College Heritage Institute in Perth. 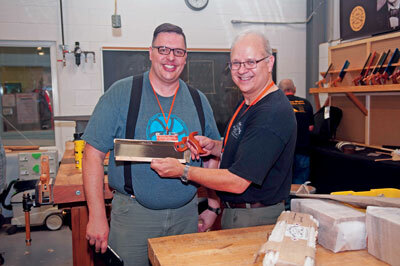 Woodworks was everything you could want in a woodworking weekend. Approximately 200 people in a beautiful location, a great line up of internationally-known speakers, a unique emporium atmosphere of boutique tool makers and a stunning collection of inspiring furniture. on deck for the weekend. Even a power failure within minutes of the start of the first talk on the first day by Christopher Schwarz didn’t flap these folks! The Perth Algonquin campus provides purpose designed and built learning environments for speciality trades, business and community and health studies. The big focus here is The Heritage Institute. 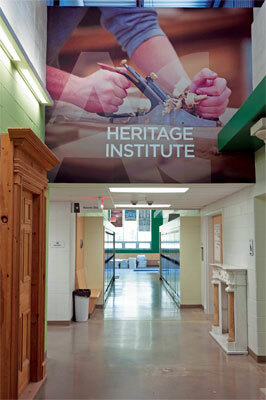 Algonquin’s unique Heritage Carpentry and Joinery programme is aimed at students who are interested in the preservation, renovation and restoration of historical architecture in Canada. It also offers programmes in Construction Carpentry and Advanced Housing, as well as Heritage and Traditional Masonry. This is the third official Woodworks event, but the first one to go national. 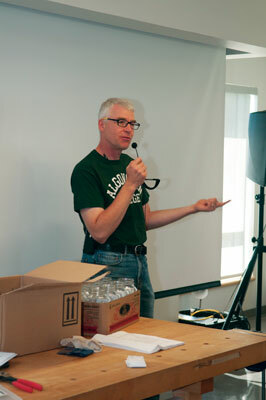 The first two were one-day club events with local speakers and a modest furniture exhibit. Before that, folks would gather annually in a club member’s garage for a day dedicated to all things to do with hand planes. Since the demise of the annual woodworking show in Ottawa and the growth of events like Handworks 2013 – see F&C 208 – Woodworking in America and Fine Woodworking Live, there has always been a sense that the market needed a bigger event. The feeling was that if the Ottawa Woodworkers Association didn’t do it, someone else would. 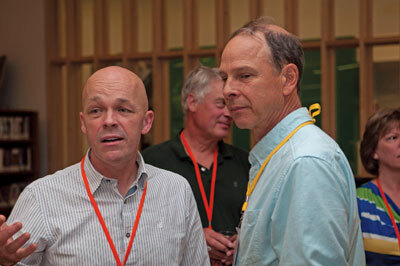 “Along the way we’ve had great advice from the organisers of past events and tremendous support from Lee Valley Tools, one of our main sponsors,” said Woodworks conference chairman Vic Tesolin. A large part of the success of the weekend was that it was a very dynamic event. Alongside Woodworks the Conference and a well-attended tool emporium, was WoodObjects the exhibition with a juried display of 29 pieces by 17 makers. Jurors were none other than Garrett Hack of Vermont, Michael Fortune from Toronto and Ron Barter, owner of Rosewood Studio in Perth. 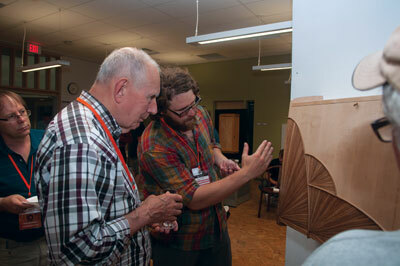 Garrett and Ron were also presenters and were available all weekend to give the makers feedback on their pieces. an emphasis on original design, excellence in workmanship and diversity of approach. This version was no exception. The organisers of Woodworks ’14 made a deliberate effort to focus on designers and makers of hand tools. Lee Valley Tools was a major sponsor of Woodworks and was there displaying their new line of custom planes. Lie-Nielsen Toolworks are always a favourite – the rivalry is always friendly! Emporium exhibitors included Scott Meek Woodworks, Barrett and Sons – planemakers, Neil Cronk of The Cronkwright Woodshop, Bad Axe Toolworks, KJP Hardwoods, Douglas S. Orr – Antique Tools and Rosewood Studio. In ‘Finding your own Voice’ Garrett Hack, long-time Fine Woodworking contributor and the author of The Handplane Book and Classic Hand Tools, encouraged people to try lots of possibilities and pick elements to form a design vocabulary of their own rather than merely copying others. 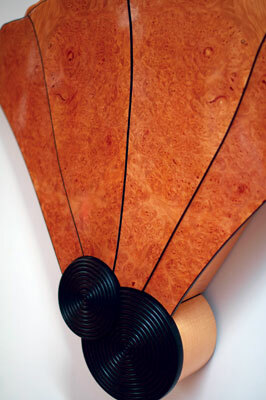 He surveyed design ideas from recent furniture making history and showed us some of the ideas he uses in his work. In his second talk Garrett spoke about making the building of furniture more efficient. Not surprising, he extolled the efficiencies of sharp, appropriate tools, of knowing where the transition is between machine work and hand work and of taking advantage of the possibilities afforded by hand tools. He stressed the importance of mock-ups of complex parts as a way to try ideas, testing how something works, to show a client or to practise a technique. Linda Manzer, a world class builder of finely inlaid guitars for some of the best players in the world, showed some of the work she is famous for and spoke of the risks she has taken over the years that have set her work apart. Her advice was ‘you have to go out on a limb sometimes because that’s where the fruit is’. 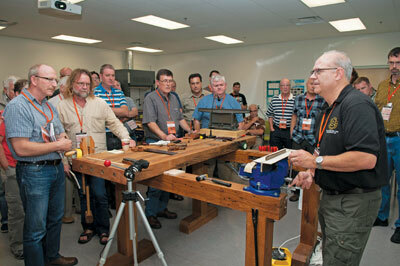 For Mark Harrell of Bad Axe Tools, it was standing room only for two sessions demystifying the traditional backsaw. He showed how to take it apart, clean it, sharpen it, re-tension it and put it back together as a finely tuned tool capable of precision work. Woodworks drew consistently high praise from participants, exhibitors and presenters, saying: ‘I’m already looking forward to coming back!’ and ‘content was excellent. Awesome scope from ‘how to’s’ to ‘why’. Very inspiring’. Woodworks ’16 is already under discussion! 2. Take small steps. Things don’t happen by accident. Practice! Tom Fidgen has just launched a new membership-based website. Find out more here. Perth was founded in 1816 as a military settlement to defend against invasion by the United States. Concerns for the defence of Upper Canada arose during the War of 1812, which had revealed the vulnerability of the thin line of settlement along the St. Lawrence River between Montreal and Kingston. Perth was designated to direct people to an unsettled interior and was accomplished through British government sponsored military settlement and assisted immigration. Many of the first settlers were military veterans on half pay. Situated between Ottawa and Kingston and with a population of around 6,000, Perth has retained its historical roots. It has a big vision of how life should be and its vibrant community spirit is set against a backdrop of beautiful heritage architecture and plenty of open natural spaces.